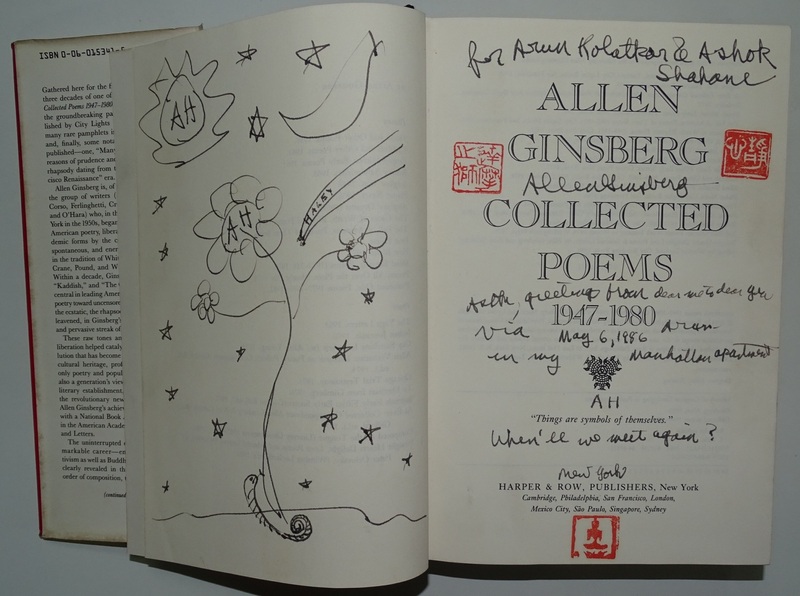 This is a photograph of a copy of Allen Ginsberg's Collected Poems, gifted to Arun Kolatkar and Ashok Shahane, in 1986. When Ginsberg and other Beat writers visited India 24 years earlier, in 1962, the poets met for the first time. This visit by the Beat poets is one among many other national, local, transnational, and international engagements made by a group of poets based in Bombay. It included both Marathi and English writers, as well as bilingual poets who wrote in both the languages. Anjali Nerleker's Bombay Modern traces these connections in a way that grounds the global to the locale of Bombay. She calls these poets sathottari poets. Traditionally, in Marathi literature the sathottari poets are a small group of experimental writers in the period between 1955-1980. Nerlekar, however, expands and broadens its meaning: "The term sathottari has the capability of including such regional, national, and international cosmopolitanisms through its global comparativism and its local articulation." In an important, and much-needed move, she gives as much importance to Marathi sources, as she does to English. Her analysis is not purely literary or formal, but also ethnographic. She does not only read what they wrote, but also sees what they saw, reads what they read. The Indian Cultural Forum is proud to publish an extract (pdf below) from Bombay Modern: Arun Kolatkar and Bilingual Literary Culture, published by Northwestern University Press. The Indian edition will be brought out by Speaking Tiger in March this year. Reproduced from Bombay Modern: Arun Kolatkar and Bilingual Literary Culture, by Anjali Nerlekar , (NUP/ Speaking Tiger), 2017, with permission from the publishers.